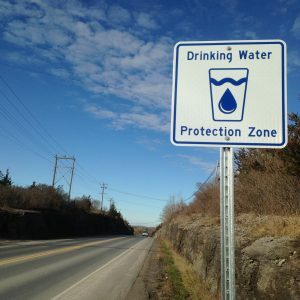 There are new drinking water protection road signs in the Cataraqui Source Protection Area, as well as across the province to inform drivers that they are entering a drinking water protection area. The road signs have been installed by the Ontario Ministry of Transportation and local municipalities to mark the locations of wellhead protection areas and intake protection zones around municipal residential drinking water supplies. Spills along roads can contaminate sources of drinking water. Road signs will promote awareness of the location of vulnerable areas and the need to protect drinking water sources. If a spill occurs in a vulnerable area, emergency responders will be reminded to inform the Spills Action Centre (1-800-268-6060) and drinking water treatment plant operators so that water distribution can be temporarily suspended, if necessary.